They say that a calm always follows a storm.. 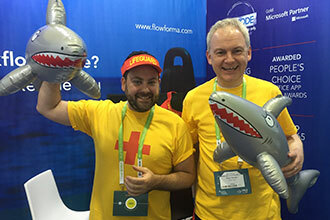 The European SharePoint Conference 2017 has come and gone, and the FlowForma lifeguards are reflecting on a busy week of rescuing delegates from drowning in workflow code! As silver sponsors we were delighted to welcome ESPC to our hometown, Dublin, providing arguably one of the most enjoyable events we’ve ever participated in. We were privileged to meet people from all over the world in a dynamic and fun filled environment, and that’s before we even begin to discuss our boat party! We loved wearing our lifeguard merchandise at our Rescue themed stand and I think the delegates loved them just as much, as we were inundated with requests from delegates to bring home the inflatables at our stand (not to mention of course the free merchandise that we gave away, everyone loves free stuff!). It wasn't just our lifeguard theme that that went down a treat, demo’s of our product were a real hit! Our 100% no code workflow tool was the real winner at the conference. The FlowForma BPM tool offers users genuine efficiency and transparency, saving time in carrying out the processes that matter in an organization! An aspect of this year’s conference which we were super excited for was our FlowForma boat party, jam packed with entertainment and glorious food and drink, we had an absolute ball! From our superbly talented magician Shane Black, to our great DJ on the night, Marty, even the Irish football team’s loss to Denmark didn’t dampen the spirits, although at least our Danish friends who attended went home happy! 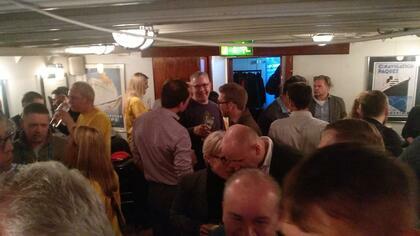 A wonderful night was followed by a delicate morning for those who attended our party. Our free rescue packs were a real saviour, coincided with our wonderful caricaturist Ken Coogan, we tried to provide a much needed lift to anyone who may have over-indulged in the Irish hospitality. FlowForma would like to thank everyone who helped make this ESPC our best one yet! To all the delegates who we met with and got to know at our stand, and to everyone who attended our boat party, we hope you enjoyed it as much as we did. Make sure to view our public album of photos which were taken throughout the course of ESPC and our party, some wonderful memories were made! I'm trying to settle back into the daily routine.. Good thing it’s only 3 weeks until Christmas! 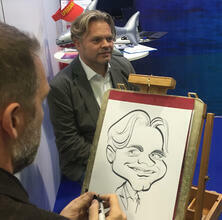 Like what you saw at ESPC? Take a FREE 30 day trial or book a demo with one of the team.